Here's the Textures Library Editor, a tool that will help Sweet Home 3D users create and manage SH3T files. The program is available as a 900 kB JAR executable file (see the end of this post for updated links) and requires you installed Java on your machine (or reuse the Java version embedded with Sweet Home 3D installer). Supported systems are Windows, Mac OS X 10.4 to 10.13, Linux and probably any system that supports Java 1.5. Very similar to the Furniture Library Editor, this tool will let you import more than a texture image at a time either with a classic file dialog displayed by the Import textures tool, or by dropping the files in the window of the tool if your system supports this feature. Once they are imported, you may modify each texture, or by group after selecting them. 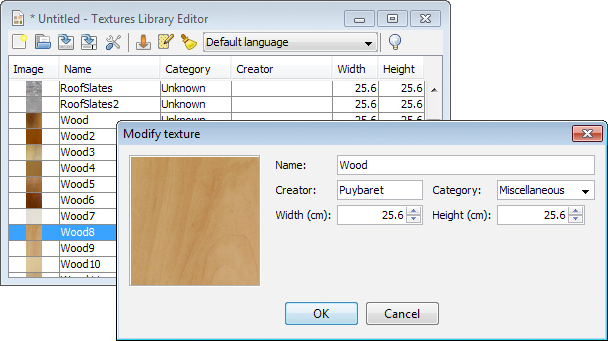 As the screen capture shows, the modification dialog displays the attributes of a texture (for those interested it's even possible to edit the ID attribute after a small modification in the program). This tool is also a translation tool that will help translators to localize more easily SH3T files: the name and the category entered in the modification dialog depends on the language chosen in the tool bar, and when you select a new language in this drop down list, all the categories belonging to 4 default categories are automatically translated into the selected language, if the language belongs to the ones supported by Sweet Home 3D at this time. Caution, there's no undo/redo feature. As always create backups to ensure you won't loose your work. This editor should be stable, but I release it as a beta version to fix easily bugs that may appear. Note also that during its development, I discovered a bug in Sweet Home 3D 3.6 and previous versions, that will save all the images of a SH3T library in a SH3D file as soon as you use only one of them. So, upgrade to a newer version, or if you can't, choose to create small SH3T files rather than a big one if you don't want your SH3D files to grow too fast. For interested programmers, source code is committed in the TexturesLibraryEditor SVN module separated from SweetHome3D one. Project contains a README.TXT file with compilation directions. I hope this tool will be useful and that you'll like it (and even more, once the bug fix in Seeet Home 3D will be released). You can't delete a texture image coming from a SH3T file from Sweet Home 3D. Simply edit the SH3T file with the Textures Library Editor and delete it from there, then reimport the SH3T file in Sweet Home 3D (don't need to restart it). On having imported a texture with transparency "texture.png" when the file to guard as texture sh3t the textures with transparency they do not guard. Some solution? Brakat, you're not at the good place to get more textures. Go there to download more textures, and if it's not enough, visit web sites cited in textures import page. Merci pour votre excellent logiciel. Serait-il possible, dans une future version de l’éditeur de textures (ou dans une future version de Sweet home 3D lui-même), de prévoir une rotation plus précise des textures. En effet, il n'est proposé généralement que 0° ou 45° ou 90°. J'ai modélisé ma (très) vielle maison, aucune pièce n'est carrée et/ou parallèle et/ou perpendiculaire à la grilles et j'ai donc un rendu de l'orientation du parquet non réaliste.